This ViperHoist wire hoist has been combined with a special gripping tool with three fingers for lifting rims. The tool is driven by compressed air and equipped with a plastic collar to ensure that the fingers find the right position on the rim. 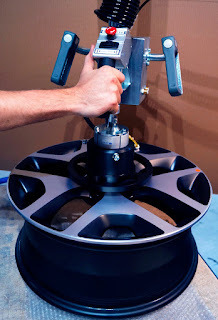 The fingers grip in the centre core and the operator can then easily and safely lift the rims. With our lifting equipment the operator can handle these rims in an ergonomic way and avoid potentially harmful manual handling. View video. Click here to read more about our various ergonomic lifting solutions for the automotive industry.